What starts as a tiny grain of sand may quickly turn into something enormous. Dust storms are a common meteorological phenomenon in arid regions across the globe, where strong winds, blowing over loose soil or sand, can suddenly create a rolling wall of dust material, blanketing cities or even an entire region. Powerful winds recently drove sand from the Sahara Desert across the Mediterranean Sea as far as the ski slopes in Sochi, Russia, turning skies red and leaving behind orange-frosted snow. Such a spectacle can, however, have widespread (and deadly) effects: in September 2015, a massive dust storm swept across the Middle East, sending thousands of people to hospital with breathing problems and leaving at least eight dead. In June 2014, the Iranian capital Tehran was hit by a 150 km/h dust wall, killing five and injuring dozens in a mass motorway pile-up due to the heavily compromised visibility. Besides wreaking havoc on land and air transportation, dust storms are notorious for getting sand into just about every nook and cranny of everything, corroding machinery and buildings; dust deposits increase soil erosion, reduce crop yields by burying seedlings and clog up irrigation canals. In addition to potentially causing injury and death through falling trees or debris or through chain-reaction crashes, dust storms are carrying a more dangerous load than meets the eye: the suspended particles can contain toxic chemicals and transmit infectious diseases. If small enough, they can slip past a body’s natural defenses – nose hairs, for example – to infiltrate and damage one’s respiratory system, triggering a spike in asthma attacks and also leading to previously undiagnosed sufferers developing the condition. The impact of such storms can be mitigated by monitoring them to issue early warnings and taking appropriate measures. This calls for a better understanding of the conditions that are prone to initiate huge dust storms. 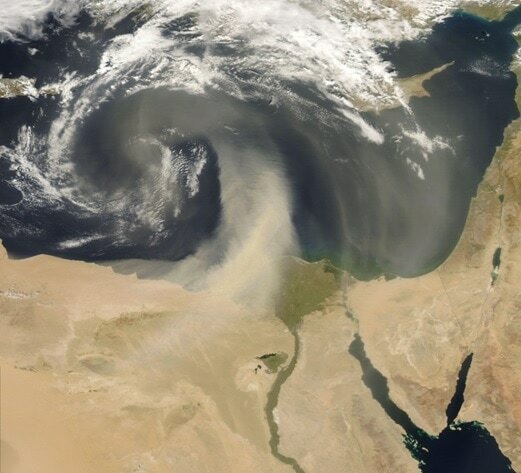 Satellite instruments, particularly the Moderate Resolution Imaging Spectroradiometer (MODIS), have revolutionised the scientific community’s ability to understand the spatial extent, pathways and the source area of dust storms. Coupling satellite images with WRF (Weather Research and Forecasting) modelling provides a tool for more accurate forecasting. A reliable internet connectivity set-up to access, download and transfer data from satellite-borne sensors and terrestrial meteorological stations is key to the success of this time-critical activity. Egypt lies within a broad band of dust-producing terrain that extends from north-western Africa eastward to Mongolia – and gets frequently hit by dust storms. The National Authority for Remote Sensing and Space Sciences (NARSS) is the pioneering Egyptian institution in the field of satellite remote sensing and plays a vital role in predicting dust and sandstorms by observing and simulating how they are formed over space and time. Dr Islam Abou El-Magd heads the Environmental Studies Department at NARSS. “A focus of our research is to monitor particle pollution, or particulate matter (PM), associated with dust storms. When breathed in, PM can cause several health problems, which include asthma, rhinosinusitis, chronic obstructive pulmonary diseases and respiratory tract infections. And it is the finer, micrometre-sized particles – 2.5 – 10 μm – that are the most dangerous ones in that respect. Analysing their spatial and temporal distribution helps us evaluate their health impact and establish an early warning system to alert the risk-prone population, in particular children, the elderly and those with predisposed respiratory and cardiovascular disease”. Generated through the WRF model, the below NARSS images show the concentration of PM 2.5 μm and 10 μm at 5pm on 7 April 2013, respectively. Whilst their distribution is similar, the density of the finer and more harmful particles (PM 2.5 μm) is much higher. Combining WRF-based air quality modelling with MODIS satellite images allows to analyse the spatial and temporal PM distribution over the same day. This, in turn, enables Dr El-Magd and his team to support the authorities in issuing timely alerts and for people to take appropriate measures to avoid being exposed to the devastating effects of an incoming dust storm. The essential internet power for this data-intensive and time-critical endeavour is provided through NARSS’s connection to the Egyptian National Scientific & Technical Information Network (ENSTINET), Egypt’s scientific NREN. Egypt is a partner in the EU-funded AfricaConnect2 project which aims to develop high-capacity internet networks for research and education across Africa. The African Earth Observation community is set to benefit from this dedicated connectivity, particularly in the context of the AfriGEOSS initiative; developed within the GEO framework, AfriGEOSS will strengthen the link between the current GEO activities with existing capabilities and initiatives in Africa and will provide the necessary framework for countries and organisations to access and leverage on-going bilateral and multilateral EO-based initiatives across Africa, thereby creating synergies and minimizing duplication for the benefit of the entire continent.